Across the entire Prydian Precinct there are Planetary Militias otherwise known as Planetary Defence Forces. Each of these forces its own local designation and name but every one of them is known to the precinct as a whole by their home planet and numerical designation in the case that the star system has more than one inhabited world. Their primary role and in most cases only role is to defend their world against invasion and occupation. This they must sometimes do alone or more often with the bolstering aid of Muster and or Retained Knights from the controlling interest of that world; a Marcher Baron or the Prydian Army. Planetary forces owe their loyalty to the Marcher Baron who controls that world. In terms of numerical size the largest Planetary Militias number in the hundreds of millions on worlds such as Yordan Prime down to the smallest which number only in the dozens on foundling colonies. There is an emphasis among intra atmosphere defence forces on armour and equipment that has the smallest amount of maintenance and requires minimal training. As a result they make up for in numbers what they lack in skill against superior forces. Ease of use wins out over higher effectiveness. Often armaments are purchased or fabricated on mass by the Prydian Army or the local Marcher Baron and are based on the widely used Moth and Anvil families of weapons with additional simpler systems. Mark III Aketon non powered armour (a lower cost version of Muster Aketon MkIV armour) is the typical protection for defence forces with adaptations to local environmental conditions. These range from the closed helm and breather systems of the massive Bosworth ark cities to the bare headed and thin plates of an agri-world for standard Aketon to Cold Climes that are deployed in frozen conditions and Hot Climes in desert conditions. There are also localised space equipped troopers who protect off world outposts and moon bases. 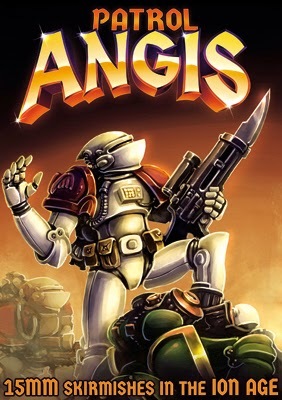 See other training series for information on Planetary Militia platoon structure, Steornede Battlesuits, Amber Portable Weapon Platforms, Amber Quad Bikes, Grima Robot Troopers and Magog GNATS. Training series searches for Colabreta and Hazelwurm along with Verticopters will provide vehicle information. All banner command level soldiers and knights must have operation knowledge of local system Planetary Militias. Now is the time! Thanks for all your emails and comments looking forward to this free expansion PDF and today is the day. 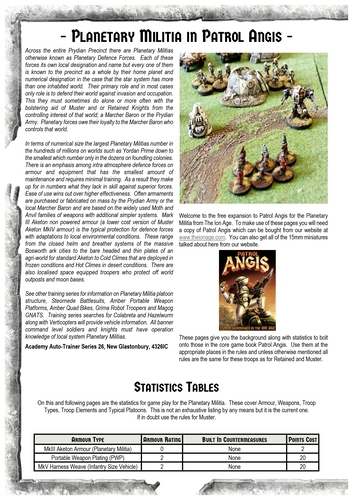 The Ion Age is happy to present The Planetary Militia in Patrol Angis as a four page PDF which contains fiction, statistics, tables, rank structure and optional test rules along with some photos of our play testing of the rules using the miniatures. You will need the Patrol Angis book but aside from that all you need is in the PDF. 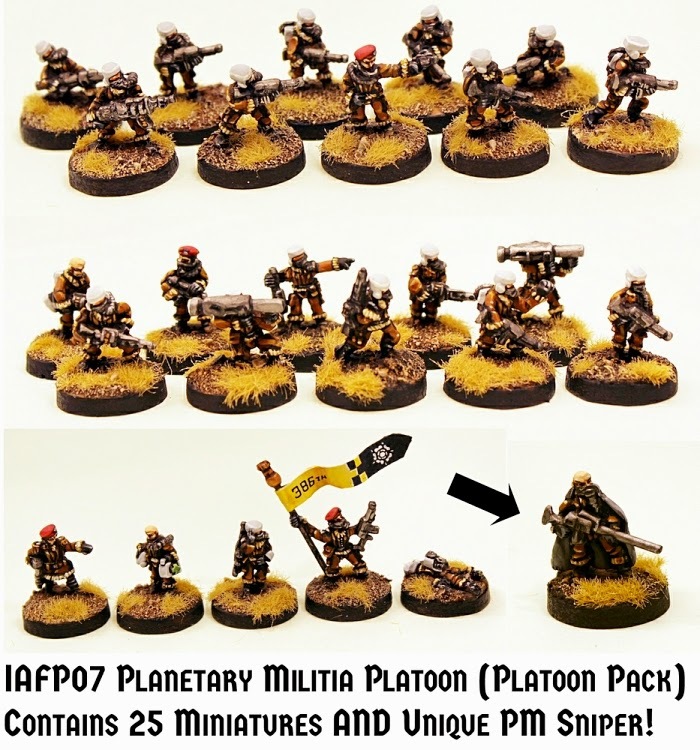 We will be expanding the codes in the Planetary Militia part of our 15mm range in the future but not for a good while as we are now moving on to an expansion of the Retained ranks which you will be learning about in the early days of July. As it stands you have all you need for infantry based skirmish with the PM as we call them. Troopers, Command, Support, Portable Weapon and Battlesuits. 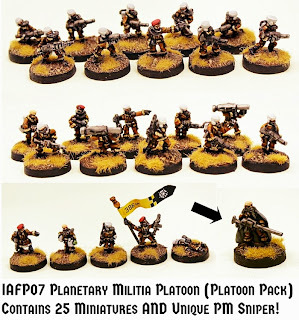 I do recommend the IAFP07 Planetary Militia Platoon as it represents best value and you get a unique to that code sniper miniature free as well. Also the Steornede Battlesuit is cool!